Public Speaking, Here I Come! ...I hope. Some people may have noticed that I changed/updated/sort-of-made-a-new page (it used to be "speaking at..." and never got any hits) last week. It's entitled speaking schedule and information on booking. Up until recently, my approach to public speaking tended to be more along the lines of "oh, yeah, I guess I probably will, if someone asks", so this new page is signifying a change in perspective. I've been doing a lot of thinking lately about the things I like doing, and how I could do them differently, as part of a last-ditch attempt to figure out ways to earn some money doing the things I actually enjoy doing, before surrendering completely to the idea of hunting for a real job. Some of this rethinking will not involve money, but money has been on my mind, as I've been thinking of how it relates to what I'm doing and want to do, which is something I never really did seriously before (I always seemed to have the mostly subconscious idea that the only way to really earn money was through far less fun ways, so those are always what I thought of when it came to money-earning). TUC 2010. Definitely a case of "what? Um, yeah, I guess!" 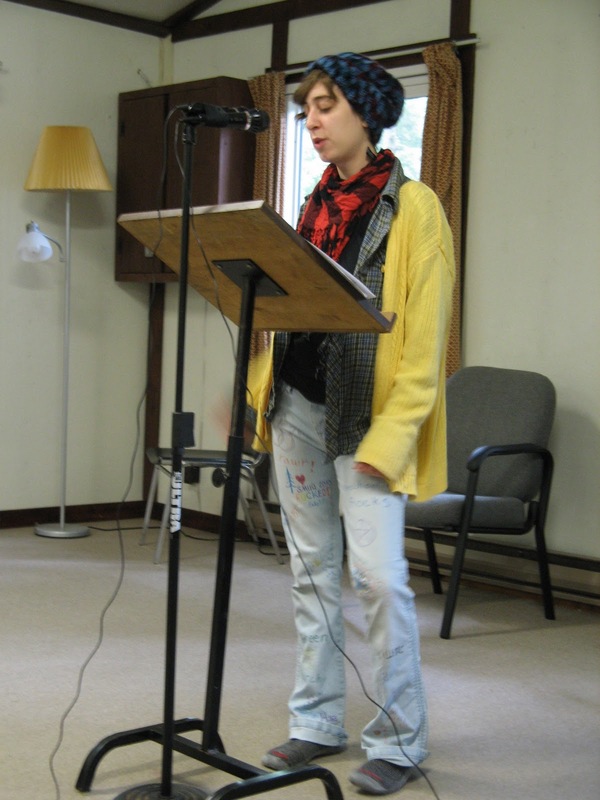 And, well, in that thinking and rethinking of things, I decided to make it clear that not only will I do public speaking, but I actively want to be doing more public speaking gigs. I enjoy it quite a bit, and though stress is often involved, it's a challenge that I genuinely like. If you would like me to speak at your event or to your group, please contact me at unschooledwriter@gmail.com. If it's something local (Montreal and surrounding area), I'm happy to do Q & A's, panels, and/or short speeches for only the cost of transportation (bus fare, basically), simply because I think it's important that people learn about unschooling! However, especially for longer speeches though for the above as well, I prefer to speak on a by-attendee-donation basis, thus helping to support me and my ability to write, travel, and speak, while still being accessible to everyone who's interested in hearing what I have to say, regardless of income level. Receiving a flat fee also works, of course! I'm very open to discussing and trying hard to make things work for everyone involved. I'm also quite happy to travel further afield to speak, with similar views on cost (paid transportation, beyond that it's negotiable). Contact me! I don't know if this will change anything in terms of frequency of public speaking (I'm currently discussing speaking in Quebec City sometime next month, though I started talking to the organizer in that case before making any changes on the blog), but I felt it was important to at least put it out there to see if anything comes of it. Comments, questions, advice, suggestions, are, as always, welcome in either the comments or by email! I received this book from the author and illustrator free of charge, but I am not receiving any other type of compensation for writing this review. It's always exciting getting books in the mail. I always eagerly rip through the packaging, quickly finding a comfy (or less-than-comfy if I'm in a particular rush) place to settle down to rifle through the pages if it's a longer book, and simply read straight through if it's a shorter one. 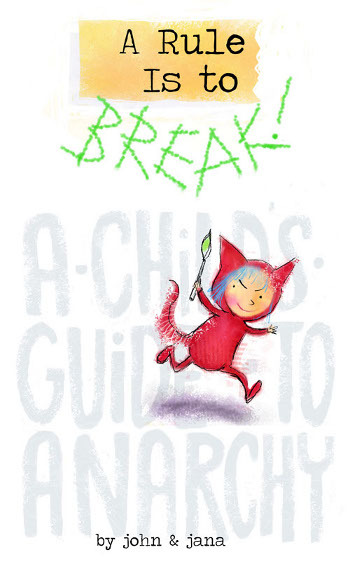 A Rule is to Break: A Child's Guide to Anarchy by John Seven and Jana Christy Seven, being a picture book, I read reasonably quickly, though I did take a bit of time on each page to fully admire the wonderfully charming artwork. I've long admired Jana's art, how gorgeous and organic it feels, the colours and textures and style... It's just lovely! And this book was no different. Well, not when it comes to the good artwork, anyway. In other ways, it is VERY different from any other children's book I've read! Many (I think it's fair to say most) children's picture books are thinly disguised morality tales, and when not outright morality tales, are still strongly pushing and presenting the norms and expectations of the dominant culture. Not particularly surprising, really, considering that the writers of most children's books, like most people, are very firmly enmeshed in the dominant culture. And really, doesn't everyone know that children should listen to their parents and teachers, follow all the rules, behave "well," etc.? John and Jana, unschooling parents themselves, present a very different view in A Rule is to Break, saying on their site "children are natural masters of anarchy, but are too often unaware of the power they wield in their cute little hands, and too seldom encouraged by grown-ups to figure that out! In A Rule Is To Break: A Child’s Guide To Anarchy that determined little devil girl Wild Child wages her own one-girl rebellion against the stifling world of adults who just want her to behave! And she brings her friends along!" With advice from "ignore school and read books! Use your brain." and "forget about grocery stores and get dirty in your garden!" 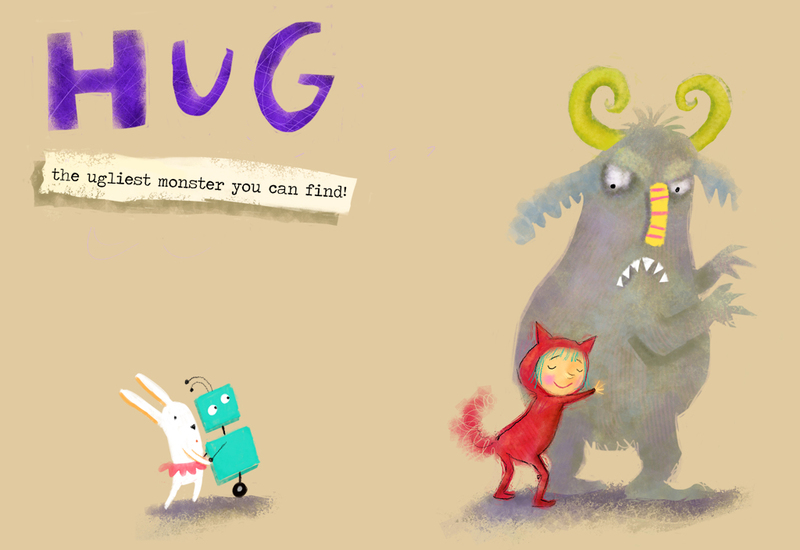 to sillier but no less engaging pages urging you to "hug the ugliest monster you can find!" this book is definitely not your run of the mill children's book. And I love that! Because what this book really feels like is that it's simply celebrating childhood: the joy, the wonder of discovery, the spontaneity and strong emotions (one page reads "go ahead and get stompy!" with an obviously angry/frustrated Wild Child expressing her emotions in the form of stomping). I also appreciate that though identified as a girl by the authors, there's nothing in either the Wild Child's dress or behaviour that conforms to any gender expectations. She's just a kid who likes doing things her own way! So there you have it. If you hadn't already gotten that impression, I definitely recommend this book. I've been bringing it with me on the various trips I've been on in the late summer/early fall, to show to anyone I think might be interested, and have been getting LOTS of positive responses to it! So if you want to buy it, you can find out how to do so here, OR you can download it for free here! I hope that you, and any children in your life, appreciate this book as much as I did. Virtually every time unschooling is covered in the media (such as the newest segment on MSNBC's Today Show) people, either in the segment itself or in the comments, refer to unschooling as an educational "method" where kids "teach themselves." And that's always struck me as being way off the mark. Unschooling isn't about unschoolers "teaching themselves": it's about unschoolers choosing how and what and with whom they want to learn. The internet and books. Here is a way that could be considered "teaching yourself." Looking up things you're interested in on the net, reading books on the subject... Yet even that isn't necessarily an all-by-yourself thing. Sometimes someone will read something out loud to me that they think I might be interested in. I regularly share article links and in turn have people send me links. I interact with people and learn from them on the internet quite often. I visit the library or a second-hand bookstore with family and friends, and we share the interesting books we find. Classes and lessons. I know, shocking, isn't it? But Unschoolers do actually take classes sometimes! My sister takes Ninjitsu and has music lessons. I've gone to various classes in the past. Many unschoolers do, because sometimes, they're just the best or easiest, most interesting or fun way to learn something new, improve a skill you already have, or just enjoy learning along with a bunch of other people! Workshops. I could have included workshops with classes, I suppose, but I wanted to put this separately because I feel like most of the time, workshops have a different feel from classes: they're more horizontal, rooted in the community, have less of a here-is-an-expert-teaching-us-stuff and more of a here-is-a-member-of-the-community-sharing-knowledge feel. In case you couldn't guess, workshops are one of my favourite ways to learn with others, share knowledge, have great discussions, and meet new people. Mentors. My sister's Ninjitsu instructor and drum teacher are both most definitely mentors. They're people she's friends with, people she respects, and people she learns a lot from (and as in all healthy relationships, no matter the type, I imagine they learn from her, as well). Mentors can be found through formal things like classes, as well as informally, through your community or extended social network. But no matter how you find them, people who are passionate and knowledgeable about something (be they accredited teachers or not), and are happy to share that knowledge and experience with others, can be a really wonderful way to learn. Talking to people. Everyone has skills and knowledge and things to share. If you simply talk to people--friends, family, acquaintances, strangers--you learn a lot about a lot of different things. The whole damn world. I think that when people are first learning about unschooling, it can be helpful to point out specific ways to find knowledge and gain skills, but when it really comes down to it, learning is everywhere. Whether walking in the woods, reading a book on architecture, going to Spanish class, talking to a friend, or contemplating clouds, learning is happening. And I think that's one of the biggest paradigm shifts people make as they move towards unschooling: seeing that learning happens everywhere, all the time, not just between certain times in the day, or when engaging in certain activities. Occasionally (really, it doesn't happen often), I've heard people say that they think that children are fine growing up with only their family unit around them: that all that kids need is a stable, loving family, and I definitely disagree with that. While I think family is/can be extremely important, humans are social animals, and I believe having a wider community is also extremely important (and I also want to acknowledge that for some people--children and adults--who do not have any family, or whose family is not loving or supportive, people from their community are the most important people in their life). So I think that by looking at unschooling as something done by a child, alone, that's really inaccurate, and misses out on what I think can be one of the best things about unschooling: the fact you're living in the actual world, interacting with lots of different people, learning and discovering within your family, and within your community. So, sometimes unschoolers learn on their own. Sometimes they don't. Some unschoolers spend more time learning with others, some unschoolers spend more time learning alone. But overall? Unschooling definitely isn't about only ever "teaching yourself"! Blogging can be a wonderfully versatile form of self (and public) expression: you can use it as a journal; to showcase your art (photography, painting, comics, short stories, longer stories...); to share a subject you're knowledgeable about, or to document the process as you learn about a brand new subject; to keep people up-to-date on a community project; to provide support and information, to make connections with others, and a thousand other uses. Basically? Blogging is really cool! In this workshop, we'll aim to have every attendee figure out what they want their blog to be about, then set up an account and blog with Blogger (a free platform that lets you create and customize blogs). We'll also dicuss networking with other bloggers, building a readership, and other relevant blogging basics. Though this is a one time workshop, there's the possibility, if attendees are interested, in continuing to learn and share through a blogging club. Experienced bloggers who want to share their knowledge and experience are also very welcome to attend! Who is it for? Anyone, homeschooled, unschooled, or schooled, who is in their teens through early 20's. Who's hosting the workshop? The workshop is being organized through the brand new IMAGINe educATION resource centre for teens and young adults (http://www.centreimagineeducation.ca/english.php), and being facilitated by Idzie Desmarais. Bio: Idzie often refers to herself as an unschooling vegetarian animistic green-anarchist feminist hippie child. She dropped out of kindergarten, and instead grew up pursuing her varied passions and figuring things out in her own time. She became passionate about unschooling and freedom-based education in her late teens, and in the several years since she's established a well-known blog entitled I'm Unschooled. Yes, I Can Write. (yes-i-can-write.blogspot.com), attended multiple unschooling conferences and gatherings, spoken about unschooling at various events, and has had articles appear in several education related publications (Life Learning Magazine; Our Schools, Our Selves; Homeschooling Horizons). For more information on this workshop, including where it's being held, contact Idzie at unschooledwriter@gmail.com. For more information on the center, contact Marilyn at marilyn@educationevolution.org.